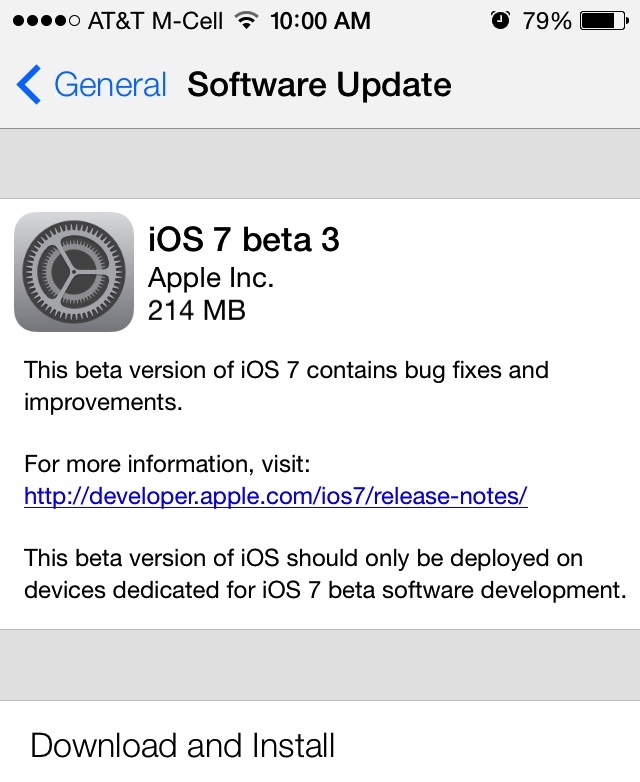 Exactly two weeks after releasing the second beta of iOS 7 to developers, Apple has just pushed out a third beta version for testing. The update is arriving as both an over-the-air update to existing beta testers and through the iOS Dev Center. The new beta arrives as build 11A4414e, up from the second beta at build 11A4400f. Apple has also released a third developer preview of Xcode 5. A report from late last month had indicated that the third beta was scheduled to arrive today, although many have regarded the two-week interval as an obvious prediction given Apple's past release history. Apple typically runs on 2-3 week intervals for releasing developer builds of its major iOS operating system versions. iOS 7 is scheduled for release in the fall of this year, with updates to Apple's iPhone, iPad, and iPad mini all expected around the same time. If past history is any indication, iOS 7 should be made available to the public just a few days before the launch of the next-generation iPhone. It's downloading pretty fast, considering how many of us are downloading. Lol, you mean the 500 nerds around the world? I'm sure apples infrastructure can support us. I predict that iOS 7 is going to be the Vista of Apple. I hate the icons. They look like something out of an unpopular jailbreak theme. No class at all. Jony Ive needs to go back to working on hardware and then need to hire someone who understand software usability. I really don't care if you guys think that skeuomorphism is not chic or hip anymore. It lends itself toward usability because user interfaces are for the "user", not the hipster wannabe designer. Usability sometimes requires a few compromises for a designers "vision". Even these icons use skeuomorphism because without it, you would not recognize which is the phone icon. See this article on what it is any why it can be useful. That design philosophy is context sensitive where the look and feel is suited to the context. The current design language in iOS 7 is not context sensitive. It is harder to use for new users and is really boring visually IMHO. 5. Calendar: Mini dots in month view for events on each day!!! 6. Camera: Much more stable, seems quicker, though not quantifiably verified yet. 8: Messages: Previously, names on the top of a message thread were pushed off center to fit the words "Messages" and "Contact". Now the name and surrounding words truncate to keep the contact name centered no matter what. "Messa... Person's nam... Contact"
11: Unlock icon animation seems 20% quicker or so. First thing I notice is that there's a 3 after the word Beta. Sick. wth? Same sorry icons again! Yes! You don't know how many times I kept hitting .com on accident. I think you young whippersnappers need a history lesson on UI design at Apple. Skeuomorphism has been an integral part of Mac OS since the beginning and it is part of the reason why people found it so easy to pickup and learn. Did you notice how Microsoft copied the skeuomorphic isomorphic design of icons from Mac OS into Windows? Win 3.11 copied ideas from the early Mac OS and Windows 95 copied ideas from Mac OS 7.x This continued for some time into XP and Vista. Skeuomorphism could be found throughout OS X from OSX 10.0 through 10.8. Why do you think OS X is so easy to pickup? Why do you think new users have such a hard time with Metro? Why do you think so many regular people hate the ribbon interface? Why do you think people hate Office 2013? It is so damn flat. I think the current designers at Apple that are pushing for flat and anti-skeuomorphism need to be fired before Apple begins another spiral of death we had before Jobs came back. Jobs is dead now, so they need to find a new visionary. Sorry but Tim Cook is no visionary. He is good at COO duties but a horrible CEO. Apple has betrayed its DNA. This reminds me of sidewalk prophet that yells at people walking by about their sins and the end of the world.